When it comes to Seagull S6, there are actually a few different models, Original, Original Slim, Original Left and Original Mahogany Deluxe SG. But if no specific model is mentioned, then it most definitely refers to the Original model. This model is manufactured by a company, Seagull that started nearly a quarter century ago in La Pratrie in Quebec, Canada. Though named Seagull, it is actually a brand under Godin Guitars. What makes guitars produced from Seagull amazing is the way it is made. Each guitar goes through more handiwork processes rather than machine processes. Featuring a solid cedar top with a 3-layer laminated Canadian wild cherry on its back and sides, the Seagull S6 weighs just 8 pounds. As is the practice of Seagull for all its acoustic guitars, the solid top of the guitar is pressure tested. This is to make sure that the top has the best level of stiffness and rigidity together with the most harmonic vibration. As a result, the guitar’s lifespan is increased and tone together with resonance is better. As with any guitar, costly or otherwise, the Seagull S6 Original comes with its share of pros and cons. 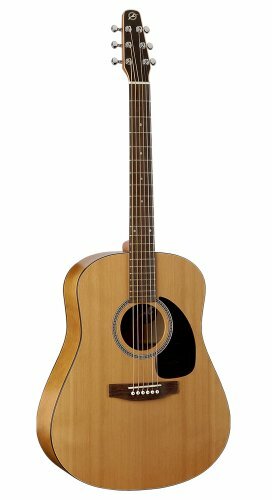 If you love to play the blues or folk songs on your guitar, then this model might be perfect for you. The reason is because the sounds that usually come from this guitar are rather full and dark. Even those who fingerpick might love this model. Some of those who purchased this guitar searched high and low for a proper gig bag. A very smart move might be to purchase Seagull’s embroidered logo gig bag and free stand together Embroidered Logo Gig Bag and Free Stand with the guitar. This gig bag fits perfect, is very secure and has two zippered pockets. Moreover, the gig bag is durable and light enough to be carried anywhere. Generally, comments from users of this guitar are positive with one claiming how he loved the wider nut, which suited his big hands nicely. Nevertheless, there are a few cons of using this specific model. A few users who had small hands did not find the neck width of 1.80 inches or so comforting. So if you happen to have small hands, you may want to take a look at the Seagull S6 Original Slim model, which is same in practically every way with the Seagull S6 Original model except for the neck width, which is around 1.72 inches. Another issue might be in terms of the guitar’s strings. One user advised others to replace the guitar’s Godin strings, which she considered of not that good quality with Elixir Strings – Phosphor Bronze that are more long lasting and of better quality. The Seagull S6 Original is currently priced around 17% lower than its original price. You can find the best price at Amazon. Though this price is higher than some other models on the market, it might be worthwhile if you love fingerpicking or playing blues or folk songs on your guitar.